A light, rugged, and dependable design, the Wolfhound made its first appearance in 3028. Following the success of the Hatchetman designed in partnership with the Federated Suns, Archon Katrina Steiner ordered TharHes Industries to produce a BattleMech to address a persistent problem of the Lyran Commonwealth Armed Forces: hunting down and destroying the Panther and Jenner, swift light-weight 'Mechs of the Draconis Combine which had embarrassed the LCAF one too many times. The final design was a light 'Mech with an all-energy weapons payload effective at a variety of combat ranges, the maximum amount of armor for a 'Mech of its weight class, and the use of mostly standard components to keep costs down. 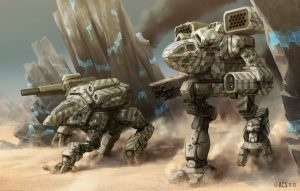 Due to their fierce loyalty to House Steiner, the Kell Hounds were the first unit chosen to field test the Wolfhound in combat, followed shortly thereafter by Wolf's Dragoons. The design received its baptism of fire during the Fourth Succession War where it exceeded all expectations and performed brilliantly. This was especially true when the Wolfhound faced its intended targets, hitting the Jenner beyond its ability to return fire while closing the distance on the Panther to get within the minimum range of its primary weapon. With the successful end of the war the Federated Commonwealth ordered larger numbers of Wolfhounds to outfit its military and the design was used again during the War of 3039. Wolfhounds suffered far fewer casualties than other 'Mechs during that conflict and a mere handful fell into the hands of the Combine. While impressed with the 'Mech the Kuritans were too prideful to copy it themselves, instead using captured examples to help develop the Wolf Trap to specifically counter the 'Mech. Eventually Arc-Royal MechWorks was brought in to produce Wolfhounds under license from TharHes, and the recovery of Lostech thanks to the Helm Memory Core allowed for a more advanced variant to be produced to combat the Clan Invasion. Unfortunately the necessary retooling of TharHes' factories to produce the WLF-2 model, introduced in 3052, took too long before ComStar brought an end to the invasion with the Battle of Tukayyid. These newer Wolfhounds continued to be produced for both FedCom member states, although following the formal creation of the Lyran Alliance the TharHes factories began producing the newer WLF-3S model. This new variant was shipped only to units loyal to the Lyran state, and thus fought on the side of Katherine Steiner-Davion during the FedCom Civil War. During the Jihad the Word of Blake launched a devastating assault on Tharkad, effectively shutting down TharHes' Wolfhound factory line; in response Arc-Royal increased production and introduced the WLF-4 model to replace the losses suffered by allied forces fighting the Blakists. As a "laser boat" the Wolfhound's very basic weapons array frees it from supply lines and allows for superior endurance during extended campaigns. The primary long-range weapon is a Cyclops XII ER Large Laser mounted in the right arm, which allows the Wolfhound to strike at ranges of nearly 600 meters. As secondary weapons for close combat, the Wolfhound is armed with four Defiance B3M Medium Lasers. Three of these are split between the right, center, and left torso, while the fourth is mounted in the center-rear in case any 'Mech tries to exploit this traditional blind spot. Ten double heat sinks allow for superior heat management, while seven and a half tons of armor provide excellent protection. While the majority of the components used in the Wolfhound are Lyran in origin, the use of a Full-Head Ejection System required the help of the Federated Suns. Countless MechWarrior lives have been saved thanks to this system's ability to operate in traditionally hostile environments. The 4W is based on the WLF-2 model and is intended as a mid-range harasser. Introduced by Arc-Royal MechWorks in 3069 the 4W has an Endo Steel chassis and carries three Light PPCs mounted in the torsos, as well as an ER medium laser and an ER small laser in the right arm. Rather than a mixtech or purely Clantech design, MechWarrior Online's version of Phelan Ward's Grinner is an entirely Inner Sphere technology replication of the main features of the Wolfhound IIC - an IS grade ER Large Laser in the right arm is supported by four forward facing standard Medium Lasers - two in the center torso and one in each side torso. Carrying a IS standard Endo Steel frame and just ten IS double heat sinks free up weight to also mount a Guardian ECM Suite. Wolf Trap - The Draconis Combine designed the medium Wolftrap specifically to counter the Wolfhound. It shares the Wolfhound's movement profile, but is far more reliant on ammunition-consuming weapons. Daniel Allard, who received one of the prototypes in 3028 after the destruction of his Valkyrie in 3027. Originally a stock WLF-1 model, it was later upgraded to WLF-2 standard and finally with Clan-tech weapons salvaged from the Battle of Luthien. Allard continued to pilot his Wolfhound even after rising to overall command of the Kell Hounds up until his death on Graceland in 3069 during combat against Clan Jade Falcon. Phelan Kell, son of Morgan Kell, also piloted a Wolfhound, which he named "Grinner", after his dog, while serving with the Hounds until it was destroyed before his capture by Clan Wolf in 3049. After being dissected and studied by Clan scientists, when Phelan was granted full warrior status Khan Ulric Kerensky authorized the reconstruction of his Wolfhound to become the aforementioned Wolfhound IIC variant. Kommandant Tamara Duke, officer of the Stormhammers piloted a Wolfhound during his battles against Clan Jade Falcon until his death in battle in Skye, in 3134..
↑ 9.0 9.1 Technical Readout: 3085, p. 68, "WLF-5 Wolfhound"
↑ Starterbook: Wolf and Blake, pp. 28, 95. ↑ Technical Readout: 3085, p. 69, "WLF-5 Wolfhound"
This page was last edited on 3 April 2019, at 16:58.